Sandy forests, especially with oak, as on old dunes along Lake Michigan. Although seemingly difficult to accommodate in the key, this species is unusually distinctive, with its very small heads on extremely slender pedicels and with the leaves thin, nearly or quite glabrous, and pale-glaucous beneath. MICHIGAN FLORA ONLINE. A. A. Reznicek, E. G. Voss, & B. S. Walters. February 2011. University of Michigan. Web. 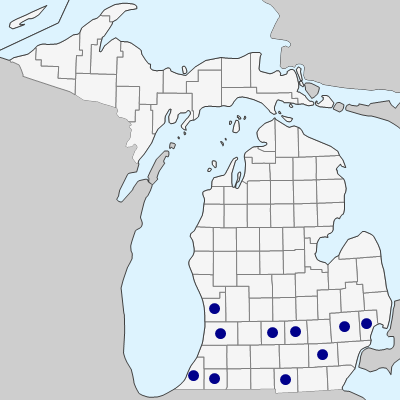 April 19, 2019. https://michiganflora.net/species.aspx?id=372.